National Gallery of Modern Art, Mumbai & Ministry of Culture, Govt. of India, supported by Art Musings presents ‘In the Presence of Another Sky: Sakti Burman, A Retrospective’, a survey of the distinguished artist Sakti Burman’s work across nearly six decades. 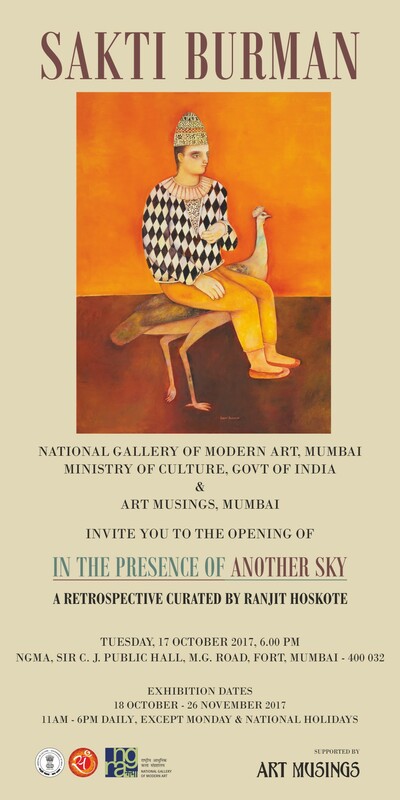 This retrospective exhibition is curated by poet and cultural theorist Ranjit Hoskote. It situates Sakti Burman’s practice in its historical contexts – as much within an evolving Indian modern as within the European lineage of the modern. Hoskote’s curatorial reading emphasises Burman’s affinities with a spectrum of artistic reference points, ranging from Pompeii murals to Dubuffet to illuminated manuscripts and miniatures. The exhibition will map Burman’s practice across the diverse artistic engagements that have characterised his journey: this includes his memorable contributions to engraving, the art of the book, drawing, sculpture, and painting in various media. ‘In the Presence of Another Sky’ will also celebrate the role of travel, of encounters with varied cultures, in the shaping of Burman’s art and world-view. At the same time, the exhibition will attend to the historical events that have left their imprint on the artist’s consciousness: the plural legacies of the School of Paris, World War II, the Partition and Independence, the Cold War, globalisation, and the post-globalisation world of simultaneously expanded and embattled possibilities. The exhibition will open on 18 October 2017 and ends on 27 November 2017. Several outreach programs are planned during the duration of the exhibition including walks with the curator, a poetry reading and a book release.